Oneflow users now have the possibility to connect Oneflow to over 1000 web applications ranging from notifications and chat systems (Slack, HipChat, Campfire, Pushbullet) to document management (Google Sheet, Google Form, Microsoft Excel) and many more. 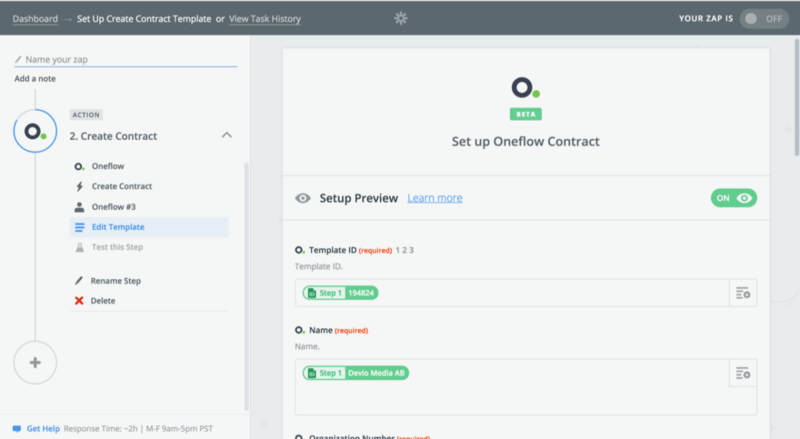 With Oneflow integration for Zapier, you can automate tasks or workflows related to your contracts such as create and publish contracts, easily search templates and contracts, or get notified when contracts events occur. The good news is you can do all this on a simple and intuitive interface. No need for writing code. 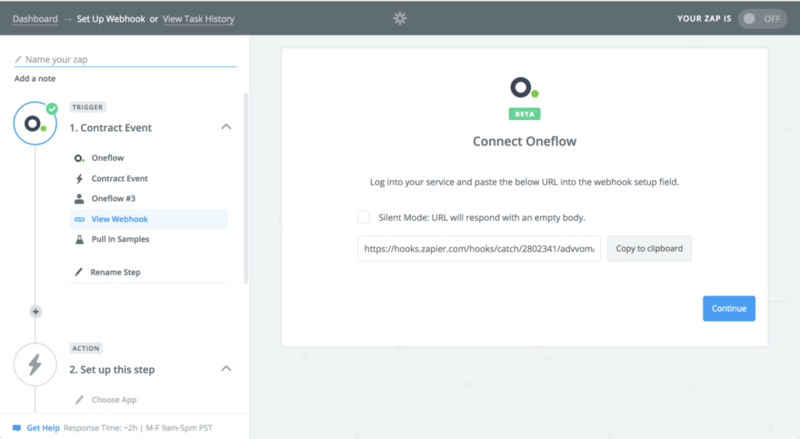 Let’s take a look at some of the tasks that you can automate with Oneflow Zapier integration. For those who are not familiar with Zapier, Zapier is a tool for primarily non-technical users to connect together web apps. An integration between two apps is called a Zap. A Zap is made up of a Trigger and one or more Actions or Searches. Whenever the trigger happens in one app, Zapier will automatically perform the actions or searches in another app in order. Create contracts with Google Sheets and Oneflow. Easily and automatically create contracts when new rows are added to a Google Sheet spreadsheet. Simply match your column to the predefined fields and you’re good to go (see image above). As soon as a new spreadsheet row is added, a new contract will be automatically created in Oneflow. If necessary, multiple participants and data fields can be used too. Tips: If you need the contract to be published and sent to the participants, just add another step in your Zap and publish the contract with the contract ID fetched from the contract creation step (see image below). From web forms to contracts in 2 clicks. 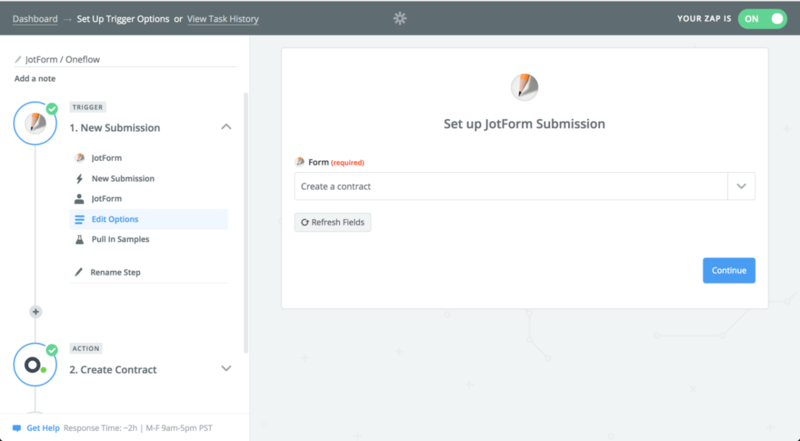 With Oneflow Zapier integration, you can easily connect web forms and turn form responses (answers submitted in your web form) into digital contracts. Create a web form using one the web form applications available on Zapier that can be embedded within your intranet or website (in the image below, we use Jotform). Use the web form as a Trigger. Then a new submission is available, data are passed automatically to Oneflow and a contract is automatically created. Notify your colleagues on Slack when contracts are signed. Send notification on Slack to your colleagues whenever a contract is signed. In the previous examples, we showed how data from a multitude of applications were used to trigger contract creation and publication to the participants. Oneflow integration for Zapier can also listen to events (signature in progress, contract signed, contract declined, and more) and be used in other applications to perform additional actions. Choose a contract event such as a contract signed as a Trigger. When a contract is signed, choose the Slack channel where you’d like the notification to be pushed to. 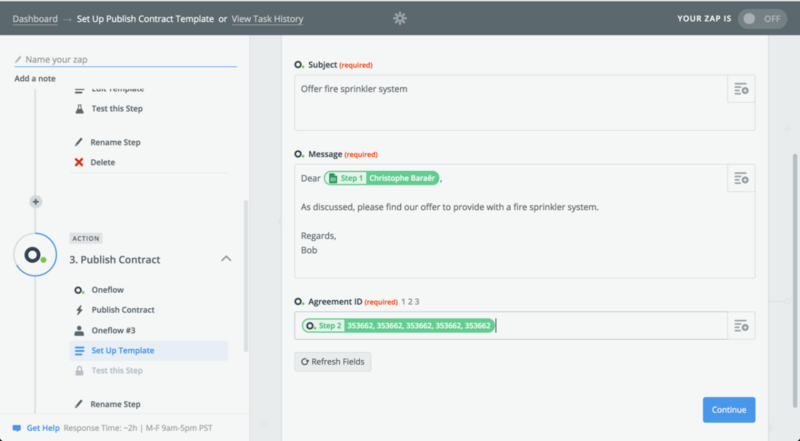 We hope these three examples will spark some inspiration in terms of the tasks you can automate with our Zapier integration. The current integration is only available by invitation. If you are interested in learning more about the integration or trying it out, please contact our Customer Care team at support@oneflow.com. The possibilities are endless.